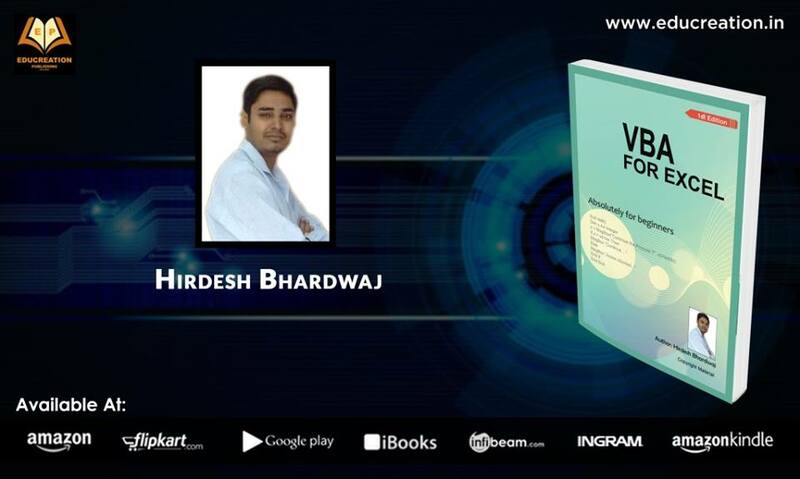 Hirdesh Bhardwaj, a well known author as well as Founder & CEO of Webs Jyoti Training and development organization in Gurgaon, INDIA. He conducts corporate and classroom training on Excel in corporates covering basic to advanced MS Excel VBA including pivot tables, lookup functions, INDEX, MATCH, pivot charts, Goal seeking, logical functions, dashboard designing and various features available in Excel. He has more than 12 years of experience with a well reputed MNCs where he spend more than 8 hours in a day working with Excel sheet, VBA editor and always try to explore new challenges in excel to make it absolute for corporate use. As an Author, He wrote books on VBA for Excel, Web Designing & PHP MYSQL. One of his Book is Recommended for Reading and Reference By NIELIT -Govt. of India, Jiwaji University Gwalior & MMYVV - The Maharishi Mahesh Yogi Vedic Vishwavidyalaya. Hirdesh started his career in 2007 with NIIT LTD as an IT Trainer Where He taught over 5000+ Students. Besides books, Hirdesh has to published about 250 scripts and tutorials in upcoming years. In November 2009, He founded Webs Jyoti , - Development and Training Organization.